Page view compliments of Tokuyama Dental America Inc.
ESTELITE FLOW QUICK is a low-viscosity, light-cured, radiopaque, submicron-filled resin composite. It contains 71% by weight (53% by volume) silica-zirconia and silica-titania filler. All filler particles are spherical (mean particle size 0.3μm, particle range 0.04-0.6 μm),designed to provide high retention of gloss and high wear resistance. ESTELITE FLOW QUICK is indicated for direct placement in anterior and posterior restorations, block out of undercuts, and repair of ceramic/composite restorations. The prominent feature of ESTELITE FLOW QUICK is RAP (Radical Amplified Photopolymerization) technology that promotes more rapid polymerization. As reported by the manufacturer, curing time can be shortened by one-third with curing lights having a wavelength range of 400-500 nm (peak 470 nm). Shades include: A1, A2, A3, A3.5, A4, B1, B2, B3, B4, C1, C2, C3, OA1, OA2, OA3, BW, and CE (Clear Enamel). Fifteen editors evaluated this composite in over 460 restorations. This product received a 93% clinical rating. 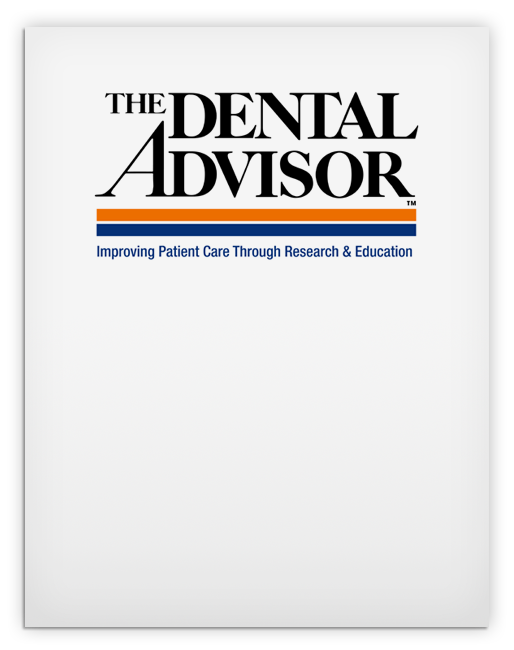 Fifteen editors of THE DENTAL ADVISOR clinically evaluated ESTELITE FLOW QUICK over a six-week period. 426 restorations were placed. 1 = poor, 2 = fair, 3 = good, 4 = very good, 5 = excellent. Instructions are clearly printed with the curing times for the variety of shades and the types of curing lights frequently used. The syringe is not bulky and is easily manipulated. Each syringe is clearly labeled for quick shade recognition, but the editors noted that more material in each syringe would be an improvement. Syringes come with plastic application tips that are curved to allow easy placement in a variety of locations. The material is easily expressed from the syringe. The editors found little or no presence of bubbles. ESTELITE FLOW QUICK has a higher viscosity than most flowable materials. It flows well into the preparation, yet has good stackability. There is a sacrifice in wettability with this material due to the high viscosity and stackability. The editors reported they would select PALFIQUE ESTELITE LV High Flow, a lower-viscosity material, in areas where wettability was desired. The editors found the shades matched the Vita Shade Guide adequately. They noted that 17 available shades were too many; adding an opaquer for blocking is suggested. ESTELITE FLOW QUICK blends well due to excellent translucency, allowing for a good chameleon effect and easy addition in a layering technique for anterior restorations. An increase in the opacity of the opalescent shades is recommended. Radiographic appearance of ESTELITE FLOW QUICK is very close to that of dentin. There was no report of sensitivity to ambient light. The RAP technology did not impair workability and was reported as one of the most liked features by the editors. The spherical particle shape and small size allow for easy finishing and polishing. The editors reported that the final polish was very good. Overall, the editors were satisfied with the qualities of ESTELITE FLOW QUICK. Though not a typical flowable composite, the material has very good handling properties, blends well, cures easily, and has an excellent overall finish that makes a quality restoration. To encourage good adhesion, the manufacturer recommends not using a dual- or self-curing bonding agent with ESTELITE FLOW QUICK.